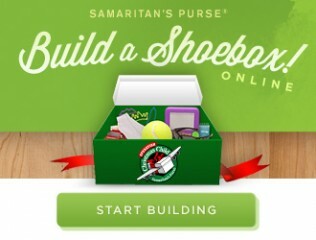 You can help children in northern Iraq by building a shoebox online. 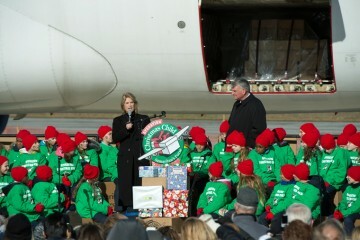 About 600 people celebrated the Samaritan’s Purse airlift of 60,000 Operation Christmas Child shoebox gifts to northern Iraq Wednesday morning at Baltimore-Washington International Airport. Braving a blustery and cold morning, they saw boxes loaded onto a jumbo jet and heard encouraging words from Samaritan’s Purse President Franklin Graham and others. Our local Christian partners in Iraq will distribute the gifts to children who have suffered tremendous loss—bringing a tangible demonstration of God’s love to conflict-weary little ones. Toys, school supplies, hygiene items, and personal notes in the shoeboxes are sure to bring some joy and comfort in this difficult season. All displaced Iraqi kids have been stripped of their homes and most possessions; many endured difficult journeys to safety; some were further traumatized by seeing their parents or relatives killed or taken captive. In total, Operation Christmas Child, a project of Samaritan’s Purse, will collect around 10 million shoeboxes in 2014 to be delivered to children in 120 countries. 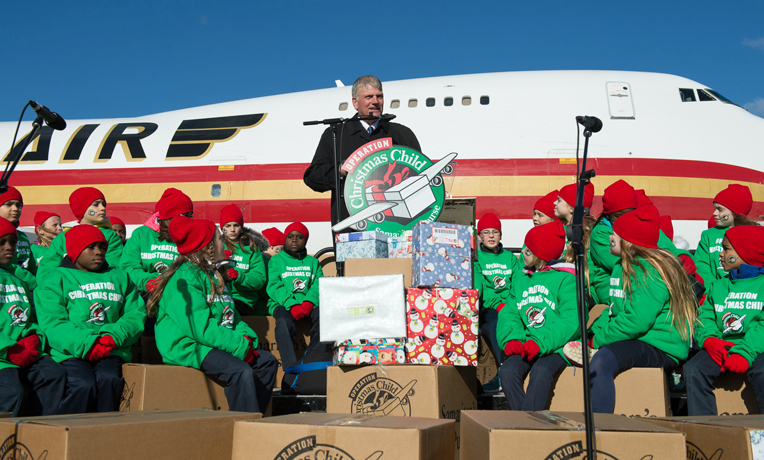 We opened a new shoebox gift-processing center in the Baltimore-Washington area this year and the first 60,000 boxes or so were designated for this airlift. Among special guests at the airlift ceremony were several couples who have benefitted from Operation Heal Our Patriots—the Samaritan’s Purse project designed to share God’s healing love with wounded military personnel and their spouses. Mackenzie and Andrew Triplett brought their boxes to the event. Retired Army Specialist Sean Triplett, a native Marylander who was injured while serving in Iraq from 2006-2007, and his wife Michelle traveled to Alaska for a week of marriage enrichment through the project in June 2013. 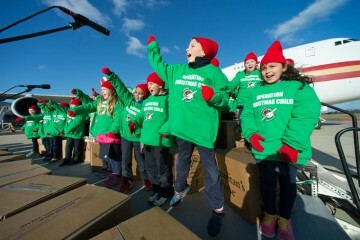 This year their family participated in Operation Christmas Child for the first time. Mackenzie, their 8-year-old daughter, and Andrew, their 5-year-old son, both packed boxes and delivered them at the event. Mackenzie shared from the stage what she packed in her box, which included a small walking pony doll. Mosul was overrun by jihadists of the self-designated Islamic State (ISIS) in June, and many children who will receive shoeboxes fled from that area. Another special guest and friend of the ministry, Greta Van Susteren, host of On The Record on the Fox News channel, attended the sendoff ceremony and addressed the audience. She spoke of her trip with Franklin Graham to Erbil in northern Iraq in December 2013. They visited Syrian refugees who had fled to escape the violence in their homeland. Now, those seeking refuge there are Iraqis displaced within their own country by ISIS. Greta Van Susteren saw the conditions of refugees in northern Iraq a year ago. 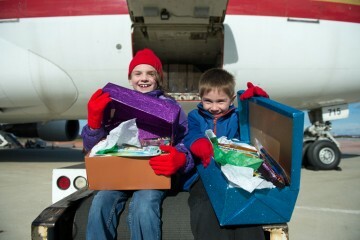 In January 2014, 60,000 shoebox gifts were sent to Iraq to bless Syrian refugee children. This latest shipment of 60,000 will build on the impact of that earlier airlift—again shining a light in the darkness. More than 800,000 people are now seeking refuge in camps and unfinished buildings as ISIS fighters remain in control of large swaths of their country. Over the past several months Samaritan’s Purse has provided food, water, tents, a power generator, mattresses, playground equipment, kitchen kits, hygiene kits, and other relief. As temperatures fall now in areas around Dohuk and Erbil, our ministry is focused on winterization—offering blankets, coats, children’s clothing, plastic insulation, and other items to displaced families from Christian, Yazidi, and other backgrounds. (The Yazidis are an unreached people group of ethnic Kurds who follow a unique and strange religion mixing elements of Zoroastrianism, Christianity, and Sufi Islam.) We airlifted eighty tons of relief for this purpose in mid-October and the last of those items were distributed during the first week of December. The ceremony started and ended with songs by 46 red-and-green-clad third-graders from the Annapolis Area Christian School. The school has packed Operation Christmas Child shoeboxes for the past 10 years. Yuliya Shubina served as emcee of the event. She received a shoebox gift as a child in Central Asia,13 years ago that gave her the opportunity to learn about Christ. She now works with Samaritan’s Purse to share her story and to explain how one box can change a child’s life. “God uses a simple box to introduce children to Jesus Christ, to give a moment of joy when joy is in short supply,” she said.